It’s about 7yrs since I did mine, so can’t really remember. Which shows this image. Which I assume is accurate. Update Weds 17 Oct on Cold Weather Rapid Flashing. Just what I needed, shows me what to look for. I'm away now for a couple of days, but will strip the boot lining out over the weekend and see what I've got. Thanks again to all for your valuable guidance so far! Has anyone cut the cover off to see what is inside ? I suspect if just a resistor or the like then could one be cut into the original loom ? This isn't going to be useful at the moment but I had a diagram of the fix including the resistor not long ago - I'll try to find it. 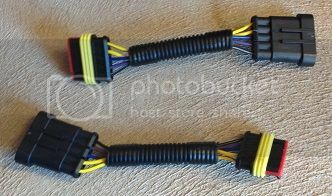 From memory it is just one resistor required between the yellow and yellow/black. This obviously isn't a fix for those with dead LEDs or blown solder joints etc.